Vacation's Untimely End: 10,000 Evacuated From Popular N.C. Destination : The Two-Way Thousands of tourists were stripped of air conditioning and places to eat after a power outage on North Carolina's Outer Banks. Now, they've been forced to leave, cutting many vacations short. 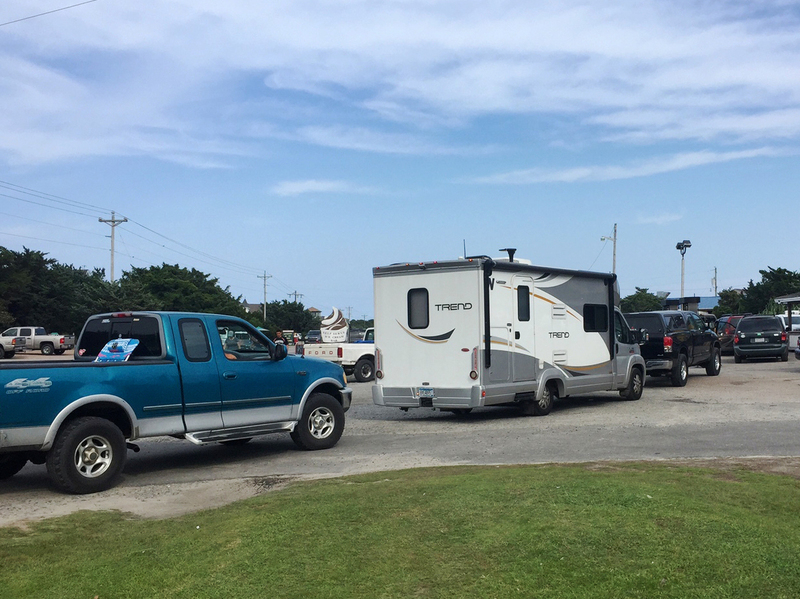 Vehicles line up Thursday at a gas station on Ocracoke Island of the Outer Banks. An estimated 10,000 tourists were ordered to evacuate the island after a construction company caused a power outage, leaving people stranded without air conditioning or places to eat. The vacation wasn't supposed to end this way — or end so early. Yet thousands of tourists discovered their summer beach trips had come to an untimely end Thursday evening, when North Carolina Gov. Roy Cooper declared a state of emergency on two islands in the Outer Banks. Authorities placed visitors to two of those islands, Ocracoke and Hatteras, under mandatory evacuation orders. All told, The Associated Press estimates 10,000 people were ordered to leave their homes. The culprit: A construction company inadvertently damaged an electric transmission cable during work on the local Bonner Bridge, effectively cutting the power to Hatteras Island and Ocracoke Island. As one might imagine, electricity is a useful — necessary, even — resource when it comes to maintaining air conditioning and local restaurants. "There's a lot of hot, sweaty people here," Erica Plouffe Lazure, a visitor from New Hampshire, told the AP. She related how the motel she had booked, hoping to circumvent the power outage, blew out its generator within minutes of starting it. "This is a beautiful island and I waited two years to come back here because it's one of my favorite places in the world," she added. "I'm a little bummed that the power has gotten in the way, but, till next time." Authorities aren't sure quite how long it will take to get power running again on the islands. The company that severed the line, PCL Construction, returned to work Friday to thoroughly assess the damage. "Did PCL just nick one of the cables? Is it worse than that?" Cape Hatteras Electric Cooperative spokeswoman Laura Ertle told local TV station WRAL. "Once they get here and put eyes on it, then we'll have a really better sense of what we're looking at in terms of repair time." In the meantime, the prime beach destination will have to do without the tourists during what's normally its busiest season — and the economic fallout that comes with that. "It's going to be huge," Donnie Shumate, spokesman for Hyde County, where Ocracoke Island is located, tells USA Today. "The island was at capacity when all this went down and this is usually the busiest time of the year for the island. It will be a major hit economically depending on how long it lasts."